They are capable of extending their tongue fully five inches outside the bill to probe deeply into anthills. Gilded Flickers are one of the two species of Woodpeckers that nest in saguaro cavities. They are larger and far less numerous than the Gila Woodpeckers that produce most of the cavities in our saguaros. The Gila Woodpeckers tend to drill their cavities in the middle third of the saguaro. 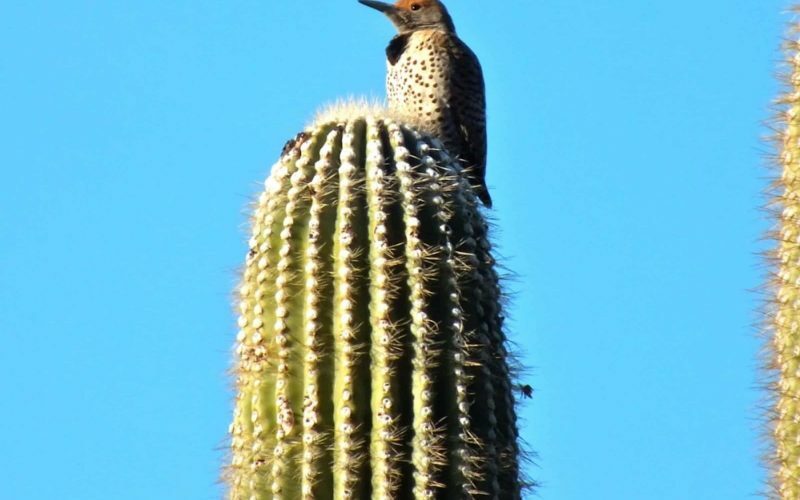 Conversely, the Gilded Flickers produce a significantly larger cavity usually placed in the upper 1/3 of the saguaro. Gilded Flickers are identified by their gray face, brown crown, large black chest patch, white rump patch and yellow on the underside of their wings and tail. They are about 11 inches long with a wingspan of 18 inches. The male has a red moustachial stripe, (photograph on right) which is lacking in the female (photograph on left). The range of Gilded Flickers is limited to the southwestern deserts of the United States. They are permanent residents here in Sabino and do not migrate. Their favorite food is ants and they spend most of their foraging time on the ground searching for and eating ants. They are capable of extending their tongue fully five inches outside the bill to probe deeply into anthills. They also make use of the saguaros as a source of food. In the spring they feed on the flower pollen and the insects that are attracted to it. In the summer time they feast on the saguaro fruits. Two broods per pair are typical with the male and the female sharing incubation duties. The young are fed by regurgitation and leave the nest about one month after hatching. The photograph on the left is the adult female and the photograph on the right the adult male.